Among the fabrics I pulled out for my lingerie sewing there are a few large pieces of stretch lace and mesh. 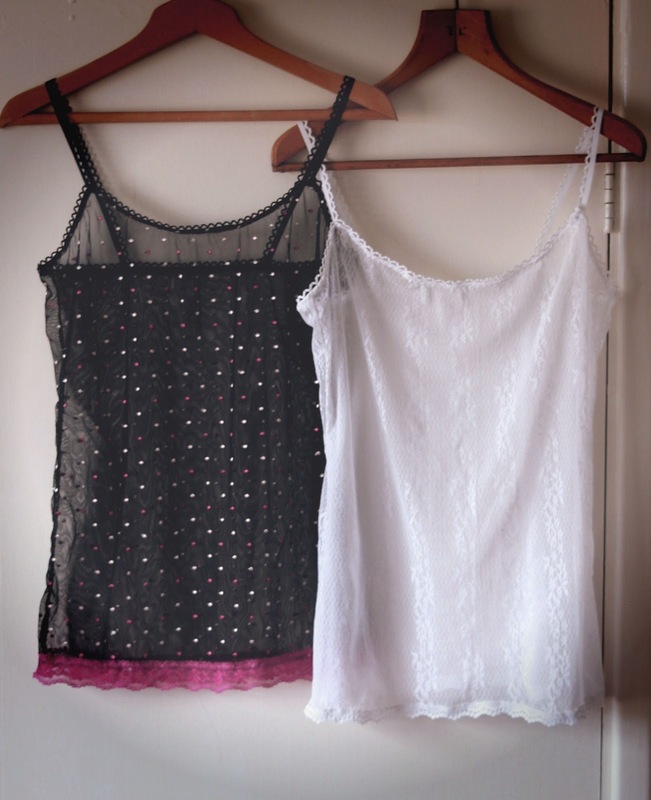 Two particularly nice ones were these: a white lace with a floral stripe pattern, and a black mesh embroidered with pink spots, which I thought would make up beautifully as camisoles to provide an extra light layer in colder weather. The lovely Zoe of 'So, Zo...' recently created this free multisized pattern, downloadable as a PDF, which fit the bill perfectly and I'd been wanting to try out. These were amazingly quick and easy to sew up, and would probably only have taken me half an hour each if I didn't have an inquisitive toddler trying to help at every turn! I made them both the same way. The side seams were stitched with a short, narrow zigzag, with a larger zigzag to overcast the edges together. I added picot elastic to the top edge, turning it to the inside for a cleaner finish with just the picot loops visible and using a three-step zigzag stitch. I finished the hems with a stretch lace border, which was simply sewn on top of the raw edge with a three-step zigzag. Not to be worn as outerwear! Coming up: How to draft high waisted knickers from a pencil skirt pattern. My Winter Coat- the four year old UFO!